Advance technology and rising trend of electric vehicles, autonomous cars and smart mobility are disrupting the global automotive industry. With the growing environmental concerns, automakers have increased their investment by 70% in lightweight material used for manufacturing in past few years. As per the US Energy Administration, reduction in vehicle weight by 10% is expected to reduce the consumption of fuel up to 8%. Many automotive startups from Israel are adopting innovative materials and technologies for automobiles which make vehicle energy efficient and give safe and comfortable driving experience. Moreover, Israeli automakers are focusing on enhancing the technologies and human interaction with vehicles. For instance, Israel based startup, Cortica, are using machine learning for their autonomous cars and holds maximum number of artificial intelligence patents as compared to other startups. Companies such as Cognata, Innoviz Technologies, Karamba Security and many more are enhancing their car's electronics and components with advance sensors for self-driving cars. Israel has technological potential for new business opportunities in the field of automotives. With the help of domestic and international investors, Israeli automakers are more focused to expand its own high-tech automotive industry. For instance, Jerusalem-based Israeli technology company Mobileye, partnered with Intel and BMW and are working together to develop a fully autonomous and self-driving cars which is projected to launched by 2021. 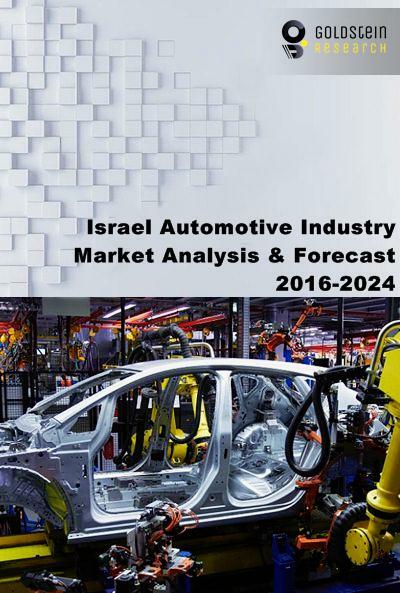 Israel automotive market is anticipated to grow at a CAGR of 7.0% during the forecast period. In 2015, total 260,200 units of vehicles were sold in Israel and the total vehicle sales in Israel reached 292,700 units and increased by 11.1% in 2016 as compared to 2015. In 2015, Israel exported over USD 3.22 billion cars mainly in the USA, Europe and Asia-Pacific region. Israel is mainly known for its zinc and magnesium parts which are supplied to many countries. For instance, Ortal Diecasting Ltd. manufactures zinc and magnesium die-casting auto parts which are supplied to companies such as General Motors, Autoliv and other automotive manufacturers. Ride-sharing, on-demand transportation and autonomous cars are gaining huge consumer interest, thus Israeli automakers are increasingly investing into autonomous cars and technologies to support the growth of automotive industry. For instance, Nexar is building a network which helps in monitoring potholes and road condition to prevent and predict road accidents. Google acquired the Israeli navigation app Waze for USD 1.3 billion to gather information related to acceleration and velocity of the vehicle and potholes in the road via smartphones. Moreover, Innoviz raised USD 9 million for the development of laser-based sensing system for cars. Furthermore, automakers are investing huge amount for alternative fuel top improve the environmental condition. Implementation of hybrid technology for gasoline or diesel engine and electric power are likely to positively impact the growth of Israel automotive market. Favorable car loan rates, cheap & stagnant gas prices, and strong economic growth of Israel are expected to bring promising opportunities for automotive sector. On the other hand, Internet of Things and big data have brought disruptive changes in the automotive industry as these technologies assist in automation, navigation and collision avoidance. These technologies along with growth in investment for vehicle development by start-up companies in Israel are transforming the Israel automotive industry. Auto giants are facing huge challenges in gathering, storing and managing huge amount of customer or vehicle data where safety assurance of customer data is becoming a major challenge. Moreover, strict regulations in terms of fuel efficiency, emissions, product safety, and reliability are forcing automakers to include safety features in their vehicles which increase the cost and spending on R&D. This rising cost may likely to create challenges for auto manufacturers and hinder the growth of Israel automotive market. Automotive Sunroof Market: Size, Share, Trends, Growth Drivers, Restraints & Key-players Analysis By Sunroof Type (Built-in, Tilt & Slide, Panoramic, Solar, Pop-Up, Top Mount) By Material Type ( Glass, Fibre), & By Vehicle Type with Regional Outlook for Forecast Period 2016-2024.